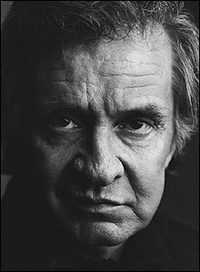 Johnny Cash died just over three years ago, and I've been thinking about him. I've never been to Dyess, Arkansas. But I'd like to go. I'd like to see the place where Johnny Cash started walking the cotton fields with his Daddy when he was no older than 3 or 4. And where he absorbed the music of the workers in the fields and at the nearby railroad yards. The place that was on his mind when he wrote "Five Feet High and Rising" and "Pickin' Time". Dyess was created in 1934, a government farm program, and Johnny worked his family's 20 acres until he graduated from high school, and then left to make music history. I spent time with Johnny on several occasions. I got to know his mother Carrie, and other members of his family. I'd been told that Johnny didn't like to analyze his success..... what made him last, while so many other performers would come and go. But during an interview in March of 1984, at the House of Cash in Hendersonville, I thought I'd pose the question anyway. I asked... "Why do people like Johnny Cash? What's so special? What is it that's been so enduring?" "I've always tried to give people their money's worth." "My Daddy told me when I was about 14 years old and chopping cotton for $3 a day, for 10 hours.... He said, you're worth $3 a day - so give the man 10 hours"
"So, when I got in the music business - he asked me how much the tickets cost for my show. I said 3 or 4 dollars, whatever they were." "He said - and how long a show do you do? I said - 2 hours"
"He said - that means you're worth a dollar and a half an hour." "And today, the tickets might be $16 for a show, so if I do a 2 hour show, I'm worth $8 an hour to each individual person sitting there"
"And that's the way I see an audience.... that I'm singing for each one of you... and I'm worth $8 an hour". 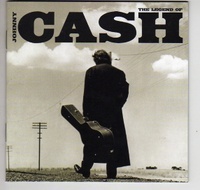 Johnny Cash certainly gave all of us "our money's worth". But he wasn't just an hourly worker. Underneath that earthy, haunted spokesman for the downtrodden, he was a tender poet. I believe in a different time and circumstance, his name could have been listed right next to Keats, or Whitman, or Kipling, or Frost.